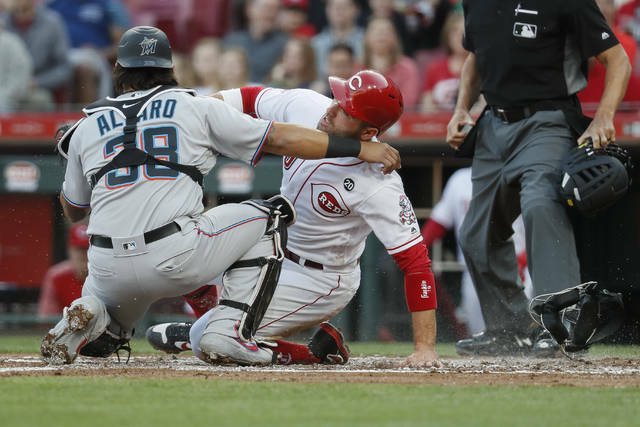 Miami Marlins catcher Jorge Alfaro (38) tags out Cincinnati Reds’ Joey Votto, center, to complete a double play in the first inning of a baseball game, Wednesday in Cincinnati. CINCINNATI (AP) — Jose Iglesias led off the eighth inning with a tying homer — only Cincinnati’s second hit of the game — and Jesse Winker connected one out later, rallying the Reds to a 2-1 victory over the Miami Marlins on Wednesday night. https://www.limaohio.com/wp-content/uploads/sites/54/2019/04/web1_122667158-ef9adff38f374b988e73e7270abb736c.jpgMiami Marlins catcher Jorge Alfaro (38) tags out Cincinnati Reds’ Joey Votto, center, to complete a double play in the first inning of a baseball game, Wednesday in Cincinnati.